The Brahminy Kite is one of the medium-sized birds of prey (raptor), with a white head and breast. The rest of its body is a striking chestnut brown. The very tip of the tail is white. The wings are broad with dark 'fingered' wing tips and short tail. The legs are short and not feathered, the eye is dark and the lemon yellow coloured bill is strongly hooked. It sails on level wings along shorelines and mudflats. Juvenille Brahminy kites may be confused with the Whistling Kite and the Little Eagle. First-year juveniles may also be mistaken for Ospreys, but are dark underneath rather than white. 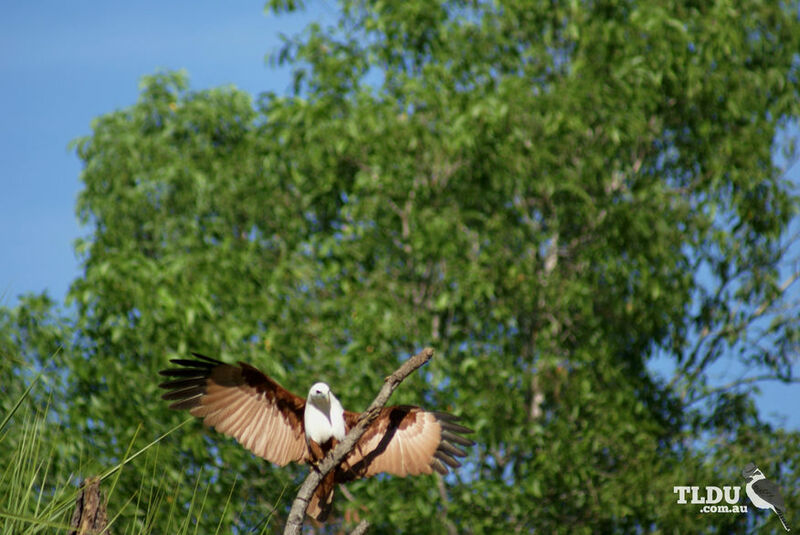 The Brahminy Kite is widespread across northern Australia, mainly along the coastline from Western Australia to northern New South Wales and is more common in the north of its range. The Brahminy Kite is a bird of the coast particularly in the mangrove swamps and estuaries. It is sometimes seen over forests and along rivers. The Brahminy Kite feeds on carrion (dead animals), insects and fish. It swoops low over water, the ground or tree tops and snatches live prey or carrion from the surface. It also steals from fish-hunting birds, snatching their prey in flight. It is known to bother other birds such as gulls, Whistling Kites, Osprey and the Australian White Ibis. Being scavengers, they benefit from waste at tips, on roadsides and in harbours. The nest of the Brahminy Kite is built in living trees near water, often mangrove trees. The nest is large and made from sticks, seaweed or driftwood and lined with a variety of materials such as lichens, bones, seaweed and even paper. Both parents incubate the eggs and the young are fed bill to bill with small pieces of food.